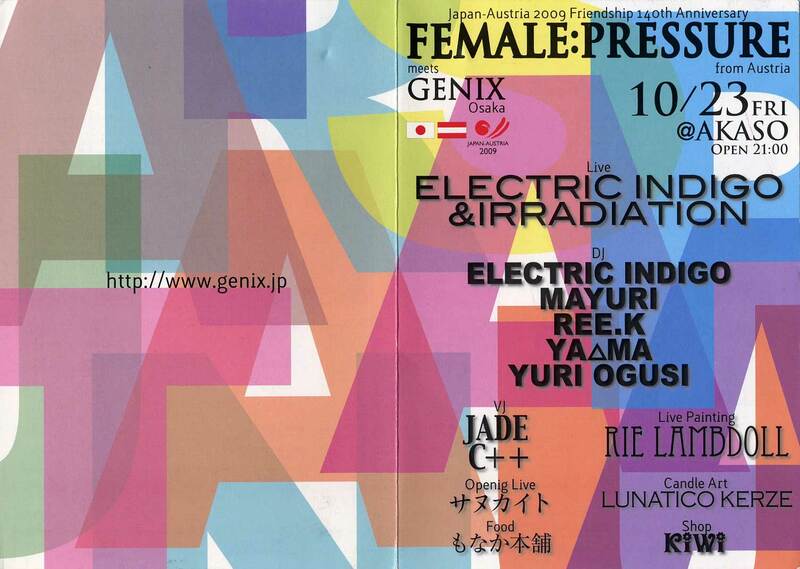 when celebrating the 10th anniversary of our international network of women in electronic music we came up with the idea to reflect the global character of female:pressure through a concert tour in japan. at this tour we want to emphasize not only the music but also the visual components of club culture. our goal is to present female:pressure and the platform's background within the "japan-austria 2009" year. originating in vienna, austria, female:pressure intends to further develop networking with asian djs, musicians and visual artists. this undertaking demonstrates the viability of contemporary cooperation crossing national and continental borders. in collaboration with mayuri akama. funded by verein stadtimpuls wien.